The early polling shows Joe Biden with an advantage. I’m not going to discount the possibility of Biden as the nominee for the Democratic Party. He emerges fairly popular from his vice presidency – most of the negatives from earlier in his career have been forgotten, though some will be resurrected once the heat of battle begins. Early polling is usually about who is known the best and Joe Biden was vice president for eight years under perhaps the most popular former president in history. A lot of people believe if his son had not died, he would have run in 2016 and would have held together blue collar Democrats and won the nomination. Hindsight is 20/20. It is hard to know if he could have defeated Hillary Clinton for the nomination. The next card that will fall is who will rise up to challenge Joe Biden for the nomination – and while everyone will be watching Bernie Sanders, one person to watch is Kamala Harris. Last week when she announced, we ran a column about her record as prosecutor – truth is I’m not a huge fan, but it’s hard to ignore that she is showing early strength. She had 20,000 people show up at her announcement in Oakland on Sunday. Twenty thousand people. Yes, that is in her own background. Yes that is in her own state, but that is a showing. It is a showing that makes you take notice. In a party that is increasingly about women and people of color, she stands out as an attractive, fairly young, articulate woman from the most populous and now one of the most liberal states in the nation. Progressives see a person who was a prosecutor, both as a DA and state attorney general, but she has the ability to take what could be perceived as a negative and turn it into a positive as she sets out a broader populist vision about “running to be president of the people, by the people and for all people. Can she turn what is an impressive start and build a national following and organization? That’s going to be the next key and she is running in what is both a crowded and diverse field of candidates for the Democratic nomination. In analyzing the “five key constituencies in the primary — Harris comes out looking stronger than any other potential candidate” — Blacks, Hispanics and Asians, Party Loyalists, The Left, and Millennials. He notes that her bio and record make it easy to see how she would be doing well with African Americans and she did very well with Latinos, narrowly losing to a Latino Democrat, Loretta Sanchez. She is currently pulling fairly low in national primary polls – but that can and will change quickly as she gains traction and name recognition. No doubt, she will have to build her support almost from scratch – while a lot can go wrong, we have seen how quickly people can rise, especially when they have a good message that resonates with voters. 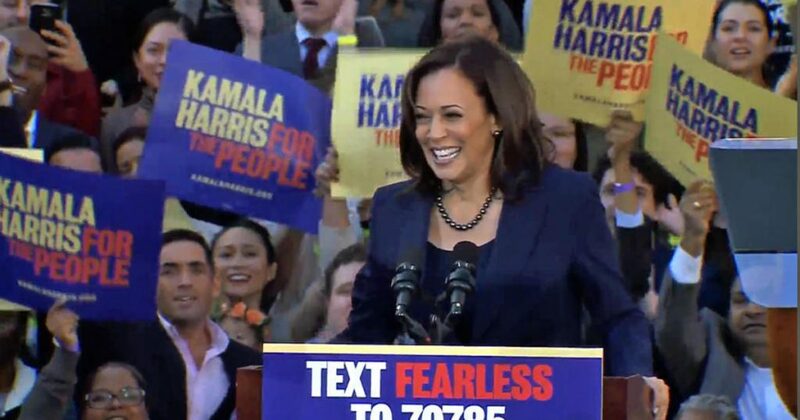 As of now, I predict that Kamala Harris is a formidable candidate who will make national waves. There are 20,000 people who showed up yesterday in Oakland who largely agree with that analysis. This is a point I was trying to make last week when Don discounted her chances. I think she is the person to beat for the Democratic nomination. Yeah, and she is a better public speaker than I remember. She may be able to stay in the upper tier of a crowded field. I do note that Bernie Sanders is expected to run, so things may get a little crowded out in far left field. So far I see the strongest contenders as Biden, Harris, and Warren…alphabetical order chosen deliberately. What I am more certain of is with the number of likely contenders, we will have a strong debate on the issues facing the country if all involved can resist the urge to push those ever so shiny, glittery, but trivial “but what abouts?”.